China Central Television, the official mouthpiece of the Chinese state, is the kind of broadcaster that many Chinese people love to hate. These feelings were given a new outlet recently, after CCTV propagated a report with a fabricated premise, related to a Chinese national who first encountered the Charlie Hebdo attackers. Wang Fanghui was in his office when the two men barged in, balaclavas covering their faces, clad in black, wearing bullet proof vests, wielding AK-47s. They told him to squat down. They said they wouldn’t hurt him, and one of them fired a bullet through the window. The other attacker then called for the shooter, and the two moved down the hall to the office of Charlie Hebdo—where they commenced their massacre. 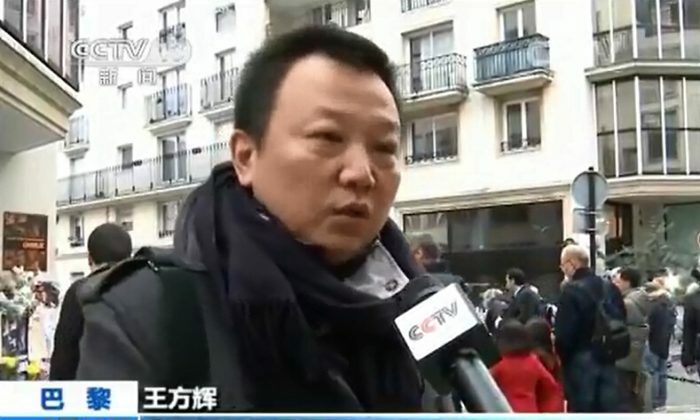 Wang was initially reluctant to speak with media, but accepted an interview with TF1, the largest television station in France on Jan. 8, the day after the attack. “My heart was still throbbing with fear. However, being a media worker myself, I know the public has a right to know. The first gunshot was fired in my presence. I could hardly justify not bearing witness to that,” he wrote in an email to a reporter with Caixin, a well-known business publication in China. But his interview with CCTV was handled slightly differently. Wang says he wandered over to the television to take in the report. CCTV’s report made the claim that Wang was only willing to speak to them—they said it was the first time he had spoken of his experience, which was untrue—after the two gunmen had been killed. “My friends in France who knew what happened were angered. They knew what it meant for me personally to face the media one day after having a gun pointed at my head. But everything turned out wrong in the CCTV program. “They also emailed me some Chinese newspaper reports about the CCTV program and they all said I was able to put my fears behind me and talk to the CCTV after the killers died. “But the reporter’s upside-down remark has left my attempt in ruins and hurt my reputation. To say the least, it was a stab to an open wound. “I simply don’t understand why a journalist would have called white black when faced with the facts. Besides, the sentences she added were trivial and had nothing to do with the point of the news. Those Umbrella Movement student protesters do know how to turn down unwanted interviews with some panache.